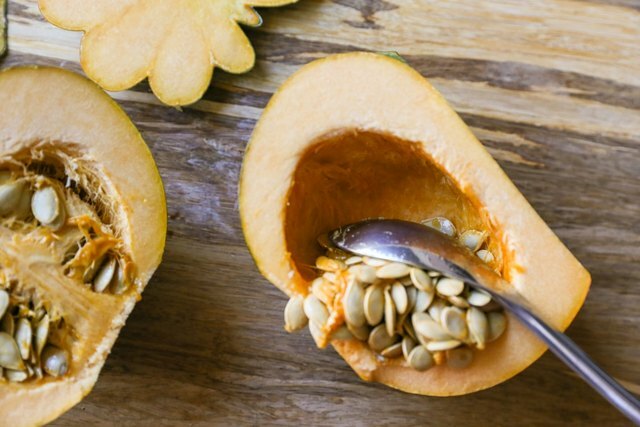 Roasted acorn squash is a comforting yet healthy dish that can be prepared during the fall and winter months. 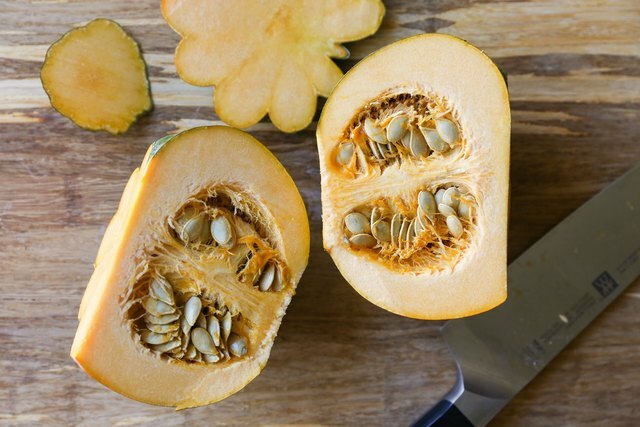 Rather than loading up carbs found in bread or pasta, you can enjoy hearty winter squash as a low-carb, vitamin-packed nutritious option. Plus, you can roast the seeds just like pumpkin seeds for a healthful snack. Roasting acorn squash is easy and there are plenty of ways you can serve it to keep the flavors fun and interesting. Stay tuned at the end of the article for serving suggestions. Preheat the oven to 375 degrees Fahrenheit. 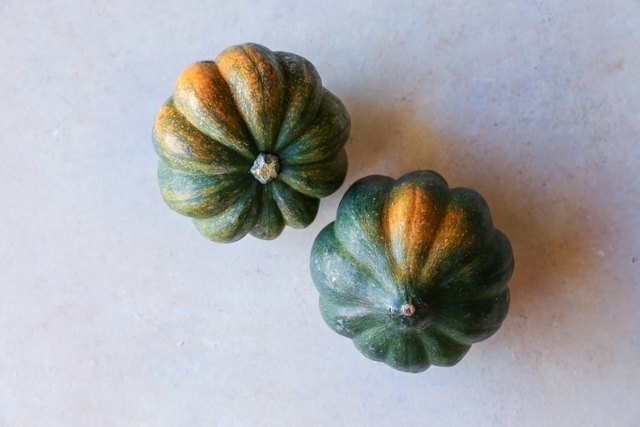 Place acorn squash on a sturdy surface and turn it sideways. Use a sharp knife to cut the tip off. Similarly, cut off the bottom of the acorn squash, then stand it upright. 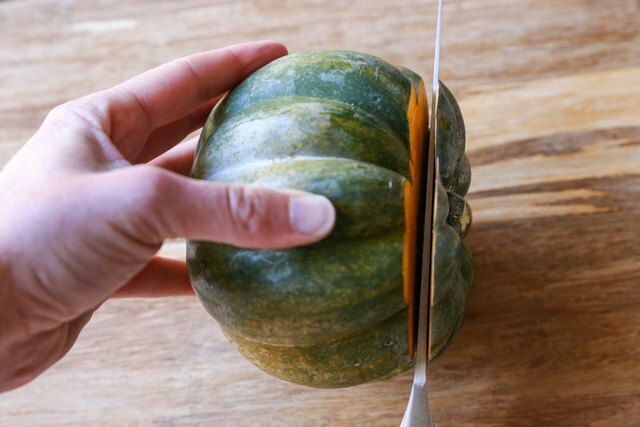 Cut the acorn squash in half vertically, using gravity as your friend to help cut through the tough flesh. Once open, you'll notice the squash has a webbing of seeds, just like a pumpkin! 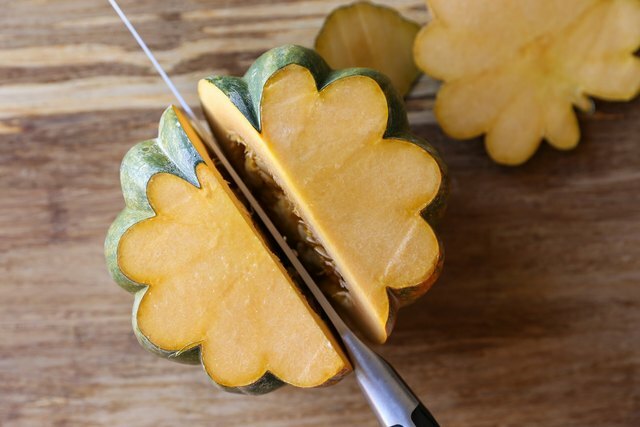 Using a sturdy metal spoon, scrap the innards and seeds out of each half of the squash. You can save the seeds and roast them later. To roast the seeds, remove the webbing around the seeds by washing them well, then pat them dry. Coat the seeds in olive oil, sprinkle with salt, cinnamon, chili powder, or seasoning of choice, and roast at 275 degrees Fahrenheit for 15 minutes. 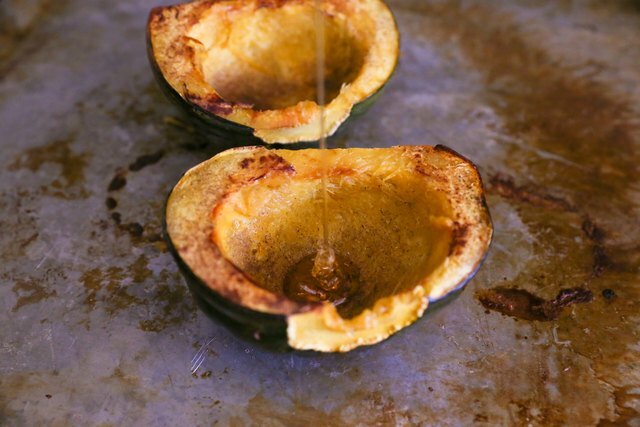 Drizzle olive oil into the bowl of each acorn squash half (about 1 tablespoon per half). Use your hands to coat the full surface of the flesh with oil. Sprinkle sea salt, pepper, and choice of seasonings over the flesh of each half. You can use ground cinnamon, nutmeg, cardamom, ground cumin, chili powder, all season spice, and so forth. 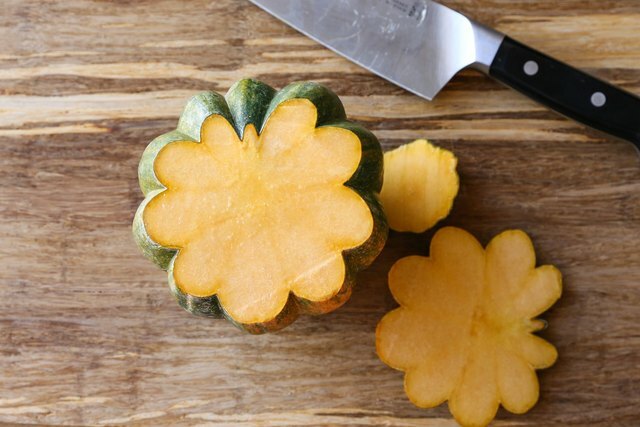 Place each half of acorn squash cut-side down on a baking sheet. Bake for 30 to 40 minutes, or until the acorn squash is tender when poked with a fork, and has reached desired done-ness. 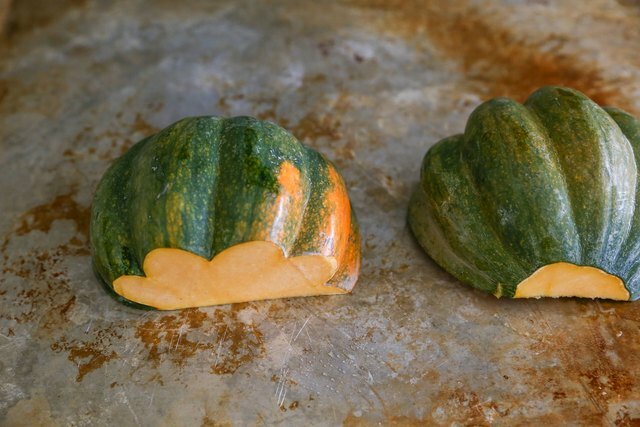 Remove squash from the oven and carefully turn it right-side up. If necessary, use a spatula to get between the squash and the baking sheet. It's ready to go! Want it to taste sweet? 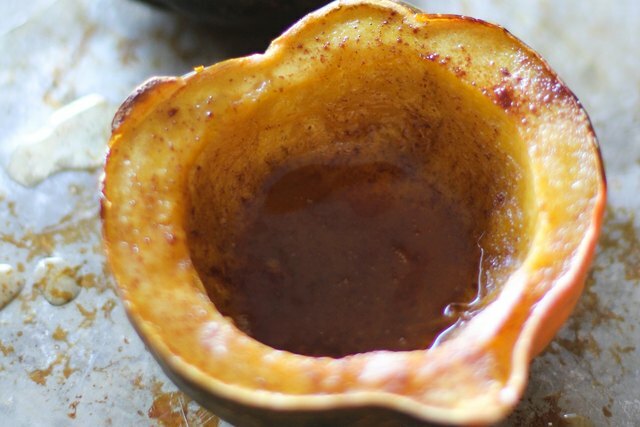 Add butter, honey, brown sugar, or pure maple syrup to the acorn squash bowls if desired. Serve piping hot fresh out of the oven with a sprinkle of salt and/or ground cinnamon. 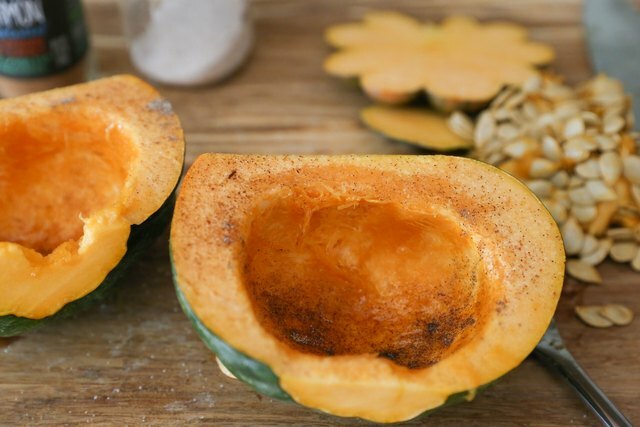 Use any of your favorite seasonings - ground cinnamon and a pinch of cardamom go with acorn squash deliciously, although you can take a savory approach as well by using a spice blend such as chili powder, Garam Masala, Cajun Seasoning, etc. 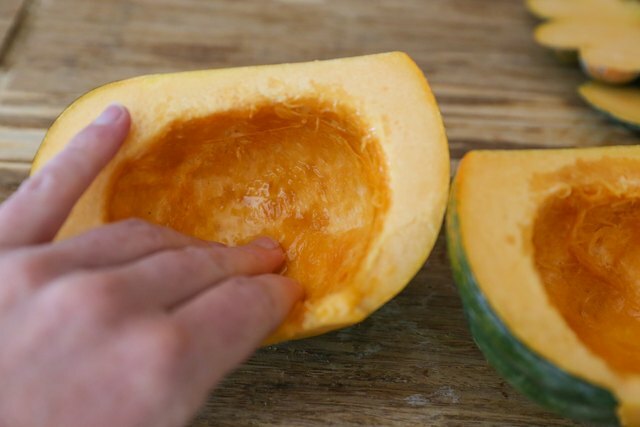 Place a pad of butter (about 1 to 2 tablespoons) in the center of each squash and allow it to melt. Add 1 to 2 tablespoons of honey, pure maple syrup, or brown sugar to the center of each squash. 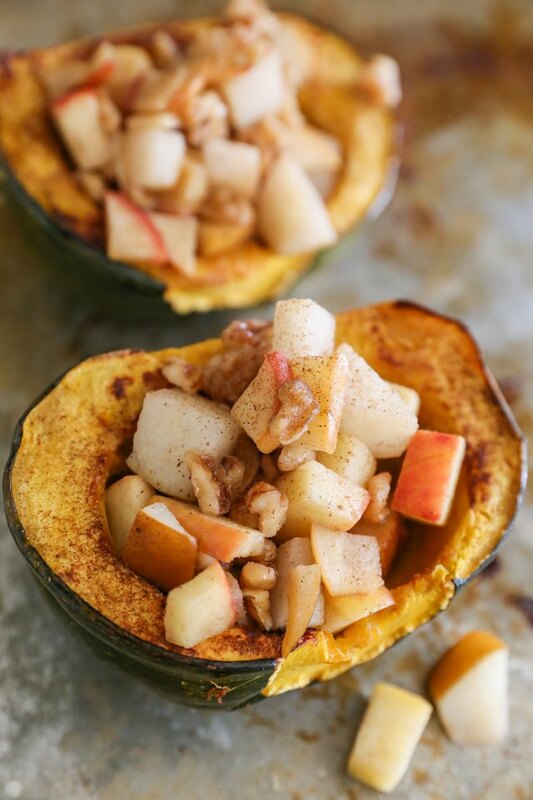 Make acorn squash an entree by stuffing the squash with brown rice or quinoa, along with dried cranberries, pecans, feta cheese, apple, and/or sausage. See this Stuffed Acorn Squash with Quinoa Pears and Pecans for example.